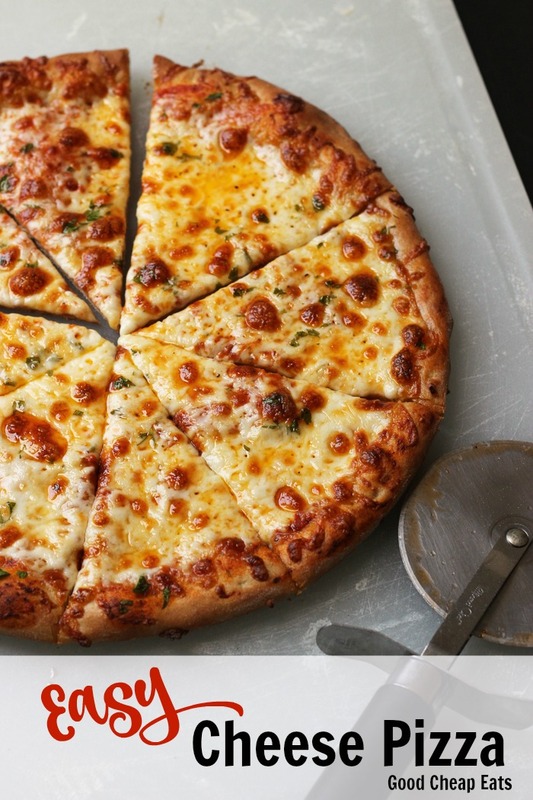 Make Pizza Night something to write home about with this easy recipe for Cheese Pizza with Homemade Sauce. Part of the secret is the blend of cheeses. Pizza night is a highlight of our week. Usually I spend late Friday afternoons assembling the makings of homemade pizza which I bake in the oven. We enjoy it with sides of Homemade Ranch Dressing and veggies or a ChiChi’s Italian Salad. Then after kitchen clean-up (or not), we watch a movie and enter into the weekend. When I first tried my hand at homemade pizza, it was a terrible failure. I gave it a few tries and then gave up. But, my friend Jessika always served great homemade pizza that it inspired me to try it again. Twenty years later, it’s a regular on our menu. Most of my crew prefers simple pepperoni pizza while the more mature ones in our family opt for The Jalapeño Burn or Burrito Pizza. 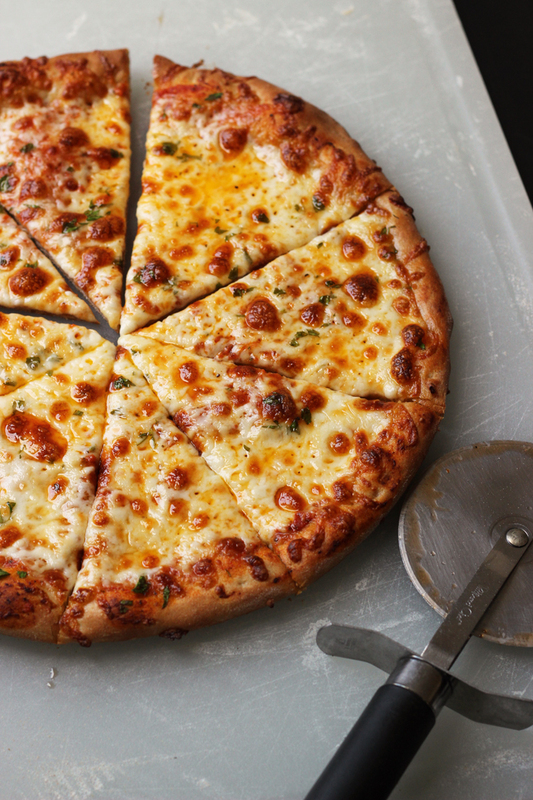 Still others go for this amazingly good cheese pizza. At first glance, cheese pizza can seem kind of boring. But, with a mix of cheeses — we like mozzarella and Monterey jack — and a homemade sauce, even the humble cheese pizza can be something special. I usually have several pints or quarts of my crockpot red sauce ready to go in the freezer. 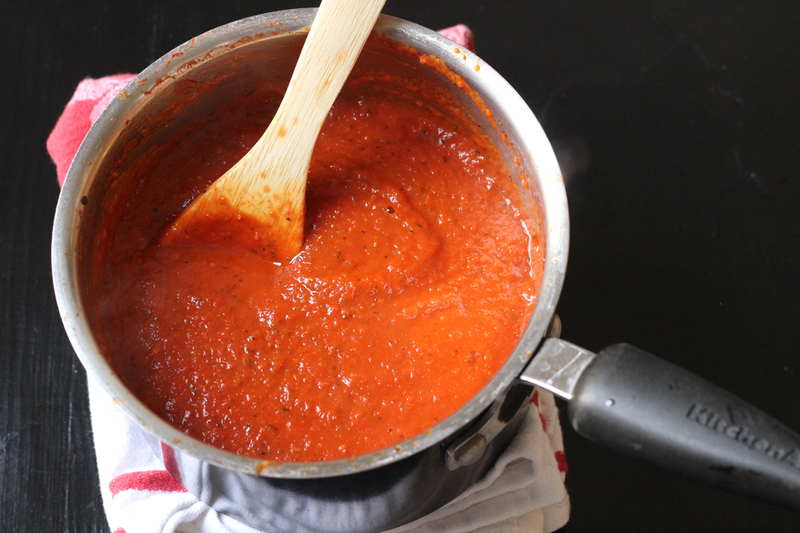 It’s a multi-purpose sauce that works for pizza, lasagna, and pasta. But, when I want to make things a little extra special, I mix up a bulk batch of this homemade pizza sauce. It’s really quite delicious and MAKES the pizza. If I do say so myself. Freeze what you don’t use for next time. 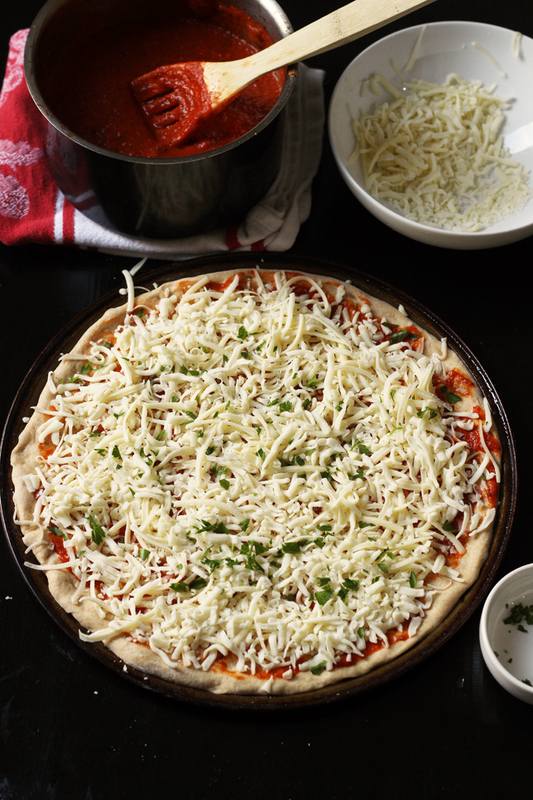 Once you’ve got your sauce mixed up and a batch of homemade pizza dough, you’re ready to making a rocking cheese pizza. The idea for the mix of cheeses is one that the Pizza Man Jerry from ChiChi’s in Santa Clarita told me about. It makes a huge difference to the taste of the pizza. Love this! Stock up on ingredients when they are on sale. In this case, I focus on buying the cheeses at the best possible price and then I stock up when it is on sale. 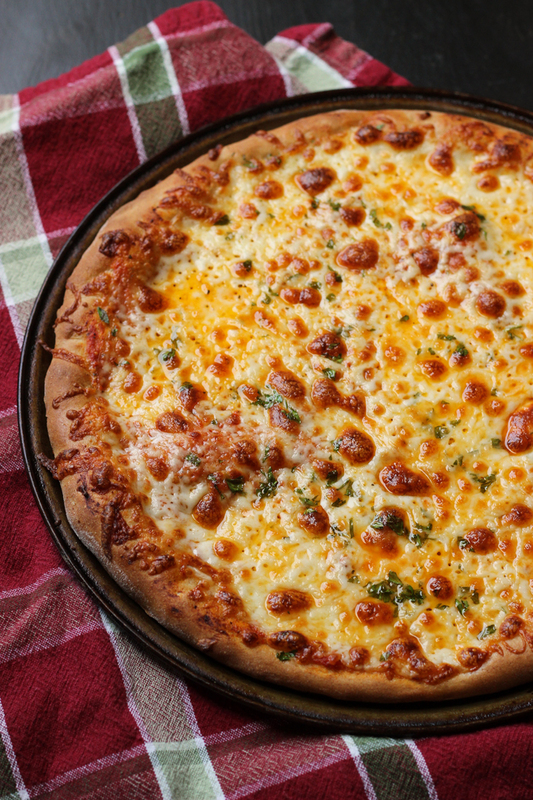 Cheese pizza may sound simple but it can taste amazing with a blend of cheeses and this homemade sauce. Spread 1/2 to 2/3 cup of sauce onto each pizza round. Top with cheese. Bake 10 – 12 minutes or until crust is crisp and cheese is gooey and golden. we love homemade pizza. it took me years to perfect the crust but finally, i have it. my girls say it tastes like it came from a pizzeria — my sign of success. like the new header/layout. happy 4th! I need to try this. My homemade pizzas leave much to be desired! I’m slowly getting this one together. I made the pizza sauce tonight. Just from the spoon….awesome. I haven’t even put it on a pizza yet. I want to get to the dough this week. I feel y’all’s pain. My kids actually look in the trash can to see if there is a box. We love pizza too, but in the summer it is often too hot to turn on the oven- so we use whole wheat pitas as our crust and make little individual pizzas. Then I can have my spinach white pizza and my husband can have his pepperoni! Last night I made your jalapeno burn pizza (minus the chicken). It will be a regular on our meal plan. 🙂 So yummy! Any suggestions? I also don’t own a pizza stone so my pizza is not crispy. I’m moving in the next couple weeks and then I hope to purchase a bread machine. Just tried your pizza sauce this afternoon, and it is delicious. I’ve had a pizza handicap forever, but FINALLY can make a good one. Thanks for posting these recipes. My family eats pizza like a horde of starving lumberjacks and we are looking forward to dinner tonight. I have the pizza sauce simmering on the stove right now, but I’m wondering if I used the right tomatoes? I bought a can of diced, as instructed, but these chunks seem kind of big and weird for pizza sauce. Did I do something wrong? Thanks for the recipes and the guidance! No, you’re good. There are chunks. They should cook down some. But, you can always blend it in a food processor or blender or with a stick blender if you prefer a smoother sauce. Either way. Im planning on using the diced tomatoes instead. Do I need to cook the sauce for a lot longer or is it the same process? How will my sauce be different than making it with the canned tomatoes? Can I just leave out the tomatoes all together and just use the tomato sauce? Thanks! It’s really not going to be a lot different. And yes, you could use sauce if you prefer. It’s a very forgiving sauce. @Jessica, Awesome! Thank you so much!! My sister made this earlier this afternoon and was raving about how she loved it :). I’m looking forward to trying it too!! @Stephanie, I mean tomato paste. Sorry!! @Stephanie, I think it will be too thick if you just use paste. Cheese pizza sounds really good. We like Mediterranean (probably spelled wrong,lol) pizza. We use onions,peppers, and black olives and spices and of course cheese and sauce. This is so delicious and simple! I made it on a whole wheat sourdough crust. Yum! For some reason when I make bread machine dough I have major issues spreading it out! Never have the problem with handmade dough. What am I doing wrong?? I am not really sure. I have never noticed a big difference unless the dough is cold. Do you roll or hand form it? Just HAD to drop a line and tell you that I. Cannot. Stop. Making. This. Amazing. Sauce!! We LOVE it and have eaten more pizza in the last few months than we have in the last few years, all due to the highly addictive sauce that rivals any gourmet pizza shop ANYWHERE. 🙂 We even had my parents over for a simple dinner of salad and pizza the other night and my mom cannot stop raving about how good the pizza was – even going as far as to say we should open a restaurant. So… thanks again for an amazing, easy, cheap recipe that continues to make me look good, my family and me happy and, as a huge bonus, that fits so nicely in our tight budget! Just tried this a couple weeks ago and our whole family loves your pizza sauce! Definitely a keeper! Thanks.